Columns can be easily created easily! Simply drag elements next to each other right on the page. Doing so creates two or three or four or however many columns you need. You can adjust the width of a column simply by dragging the blue line that divides two columns. To help keep column widths consistent between pages, a grid system makes all columns snap in place. If you want to break free of this grid, just hold "Shift" while you drag the column divider line and you can drag it wherever you like. 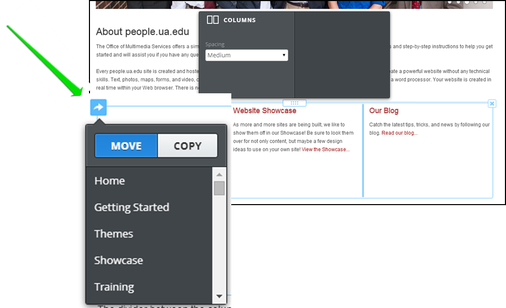 The divider between the columns doesn't show up on the published site so none of your visitors will see that. Simply click on one of the divider lines in a set of columns and the entire column becomes framed as a single element. The move / copy controls appear in the top left corner. You can easily delete an entire block of columns with all the elements inside it. Just as you did for moving and copying columns above, simply click on one of the divider lines in a set of columns and the entire column becomes framed as a single element. Now look on the upper-right hand side of the frame. You will see a small X. Click it to delete the column set.